For our Vintage Football Tailgate Party, we didn’t want to use just any ordinary table covering. 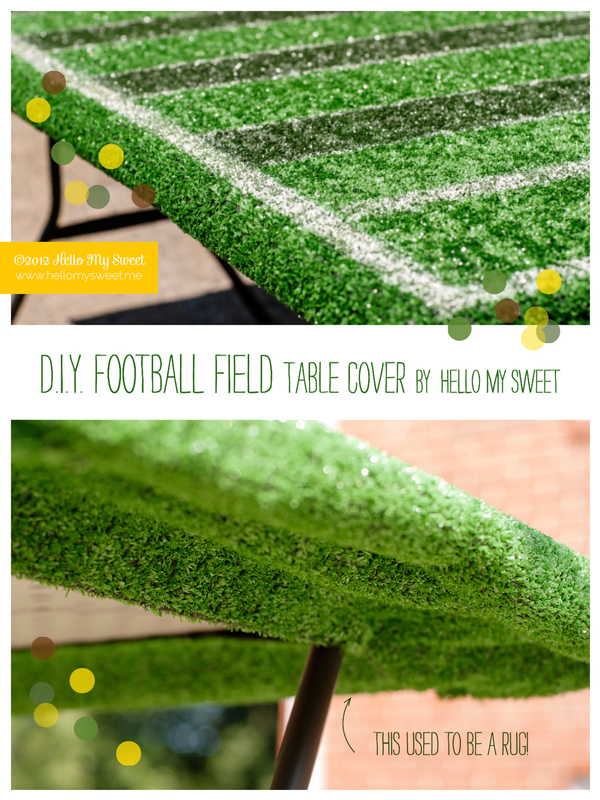 We wanted the table to look as close to an actual football field as possible. Since we didn’t know quite how to go about doing that, we took to the internets to do our research. 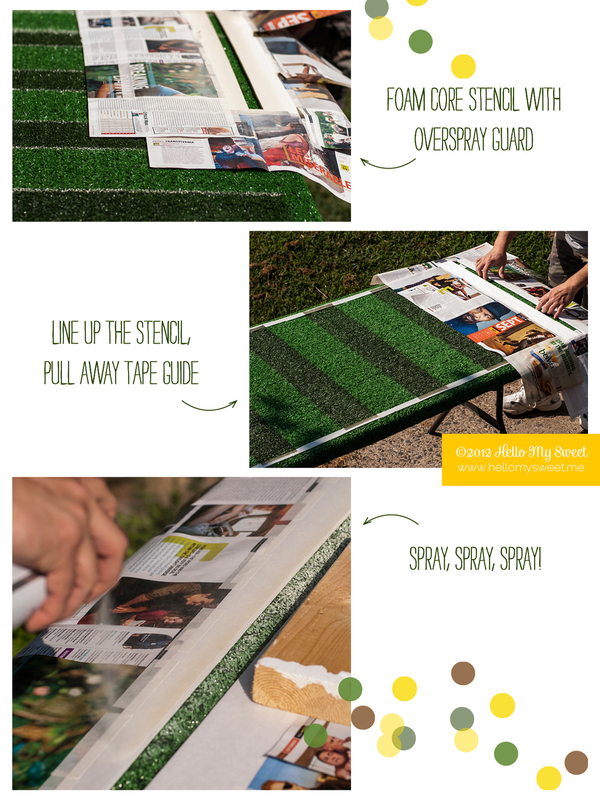 On the Lowe’s website, we found an inexpensive outdoor area rug that closely resembled football field turf. 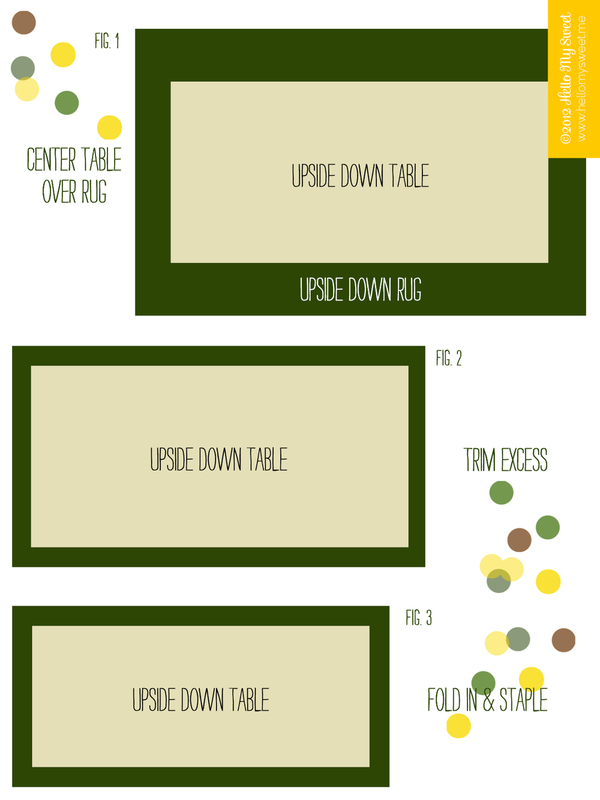 The dimensions of the rug (8x6’) were also perfect to use with our 6 ft. folding table, also from Lowe’s. The rug cost was exactly $18.26. We also wanted to spray lines and numbers down on the field. We had experimented with using masking tape, but after about one night with the perimeter lines of the “field” down, we awoke the next morning to the tape not adhering any longer and curling up. Scratch that idea! Ideally I had wanted to do the tape method as it would cut down on the time spent prepping the table, but in the end the spray paint method produced superior results, and since they pretty much do the same thing to a real football field, the end result looked even more realistic. Alternatively, you could use craft paint and a paint brush and achieve similar results (without the sprayed down effect) if you prefer not to risk the perils of spray paint. Another important thing to remember is to make sure you have a space large enough for you to work comfortably. We have an unoccupied apartment beneath ours that I have access to that provided an excellent workspace. An empty garage or even a driveway would suffice as well. Mark out where your lines will go down. (Fig.5) I used the following picture to give me an idea of where the lines needed to be in relation to the field. With a measurement of 72” long for the table, you can place 9 (7”) sections in the center of the field, and 2 (4.5”) section at either end for the “End-Zones.” You may find it easiest to mark the center of the field first and work your way out on either side. (Measuring 3.5”inches to the left and right of center first, then 7” sections on either side afterwards.) 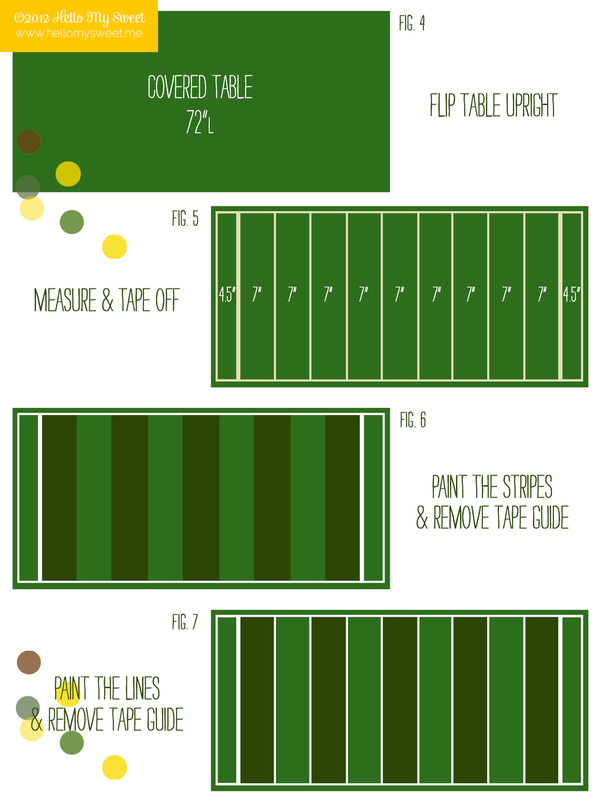 Tape down the end zone and yardage lines with the masking tape.This will serve as your guide to paint. Click the image to order the PRINTABLE PARTY set for your next get-together!